Bowling for Rhinos (BFR) is an annual celebration in support of rhinos through bowling. We hold it on the last Friday in May. For more information, go to our Tampa Bay AAZK BFR page. AAZK’s BFR provides zoo keepers of the world with an avenue to raise funds and awareness for rhino and habitat conservation. AAZK realized that the zoo keepers of the world were extremely conservation oriented and wanted to help save rhinos and their habitats, yet did not have the financial resources themselves to make any significant impact. 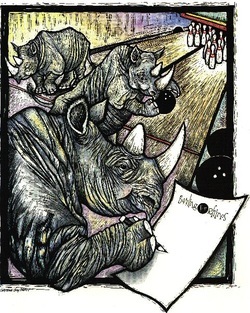 That’s when the idea came to start a national bowl-a-thon called Bowling For Rhinos. In 1990, AAZK began by supporting the Lewa Wildlife Conservancy (formerly Ngare Sergoi Rhino Sanctuary) in Kenya and has since expanded the program. The beauty of the idea is that these fundraisers are organized by volunteers, who donate their time and organizational skills to help raise money to send directly to the places in need. Since all the people involved are volunteers, 100% of all donations are sent directly to these in situ rhino conservation areas! Raising over $600,000 nationwide every year - AAZK's BFR has raised over $7.2 million since the event's inception. To check out Tampa Bay AAZK's fundraising prowess, check out this website. This year's BFR raised our highest amount ever - $9,248.50 and we couldn't have done it without our awesome members, volunteers, bowlers and donors. AAZK’s BFR fundraiser began on a small scale and is now the signature conservation effort of AAZK. In Kenya, Africa, we support the Lewa Wildlife Conservancy where our donations help protect both black and white Rhinos. The Lewa Wildlife Conservancy works as a catalyst for the conservation of wildlife and its habitat. It does this through the protection and management of species, the initiation and support of community conservation and development programs, and the education of neighboring areas in the value of wildlife. Lewa Wildlife Conservancy from Essential Marketer on Vimeo. Also in Kenya, we are supporting Action for Cheetahs in Kenya (ACK). ACK was added to the list of organizations BFR supports beginning in 2009. Their mission is to promote the conservation of cheetahs through research, awareness and community participation in Kenya. ACK works closely with local wildlife authorities and landholders to develop policies and programs that support wildlife conservation and human livelihoods for the long-term development of sustainable human and wildlife zones.. 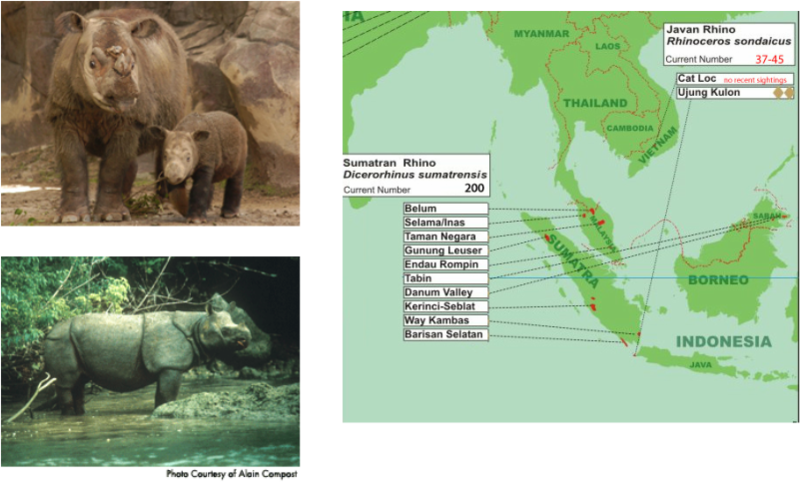 In Indonesia, AAZK supports the remaining Javan rhinos at Ujung Julon National Park and the Sumatran rhinos in Bukit Barisan Selatan and Way Kambas National Parks through the International Rhino Foundation. A: No, you do not. Besides bowling, Tampa Bay AAZK sells event-themed t-shirts and other merchandise (as available). Many items from local and national companies and artisans are also available through our Silent Auction and Raffle. Other organizations that participate in BFR don't actually bowl - examples include Rocking for Rhinos, Rummage for Rhinos, and Recycling For Rhinos projects as other ways to raise funds for this very worthwhile project. Q: Are donations to Bowling ﻿﻿For Rhinos tax deductible﻿﻿? A: Yes, BFR is covered under AAZK's tax # 23-7274856 as a 501 (c)(3) organization. Also, remember to check with your employer to see if they have a matching gift program as an easy way to double your donation. Q: Why not bowl for a different animal each year? A: It takes about 5 years for a fund raiser to take hold where the public looks forward to it so it is important to keep the name the same. BFR saves rhino habitat so it saves everything from orchids to sea turtles to elephants. In fact, Lewa Wildlife Conservancy in Kenya has more elephants (300) than rhino (80). BFR also saves cheetah, Grevy's zebra, sumatran tigers, malayan sun bears and tapirs, Javan gibbon and the coral reefs, just to name a few. Q: Why are Rhinos Endangered? A:The rhino is killed for its horn to be used in oriental medicines and symbolic dagger handles. So valuable is the horn to poachers that the rhino can not survive unless it is on protected sanctuaries such as LWC. "BFR" money is used to fence in these areas, purchase planes and land rover vehicles to curtail poaching, translocate rhino into the sanctuary, and salaries for anti-poaching security guards.